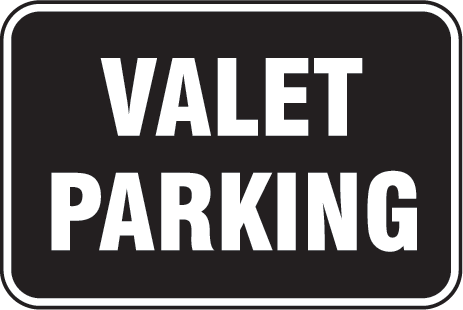 Valet parking feels wrong to me on several levels, not the least of which being unnecessary exposure to scrutiny. But there I was in North Beach, a block away from Park Tavern, where I was supposed to meet friends, unable to find a parking spot and with no choice but to use valet parking. I looked around at the clutter inside my car and thought, ok then, what can I stash? All I could think of was to hide a fork that had rice stuck to it, in the little storage compartment between the two front seats. The rest was hopeless. As I pulled up, I reassured myself by thinking this man, who just happened to be impossibly good looking, was human too. I imagined his bedroom being a wreck. As I handed him the keys I said “excuse the mess”, smiled and added “welcome to my life”. He smiled back and called out to me as I ran away “Hey”. I turned around, worried the car wouldn’t start or something, but instead he said, in a lovely Italian accent, “Enjoy your dinner, ok?”. I smiled saying, “Thanks, I will” and I promptly forgot about my car and the entire interaction while I enjoyed dinner with my friends. I was so confused. It seemed like a pick up line, but it didn’t seem even remotely close to reality. I look like I take in lots of physical activity? I’m thinking um…no I don’t…but then I looked around my car to see the following (and I am not exaggerating): a rip stick, a hockey stick, a basketball, roller blades, a skateboard.. and then what he was referring to…a soccer ball.. in the front seat rolling around with three water bottles. HA! He thinks this is all mine! When I confessed it all belongs to my ten year old son, he leaned in even closer with an even bigger smile, almost offering personal lessons, but stopped himself with “Tell him to keep playing. It’s a wonderful game. I used to play professionally.” Smiling I told him I would do that and I handed him a few dollars. I drove away with my mess and my engine light (still) on, considering the idea that maybe I could like valet parking after all. And four years later… come to think of it, I wonder if he’s still there? Anyone wanna meet me at Park Tavern? I had a boyfriend for a short while today on my flight from San Francisco to Detroit. He was funny and smart, a techie who loved his job. 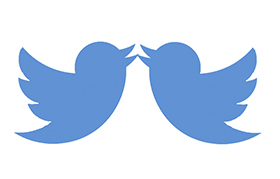 He wore a light grey t-shirt with the classic blue Twitter bird printed on the front and jeans. He was good-looking with smooth brown skin, a well-groomed beard and mustache, perfect white teeth, and an easy smile. We chatted away on the runway and through take off…laughing, comparing notes on stuff, like where to get the best burritos in the Mission. He was on his way home to New York after two weeks working in the San Francisco office. He told me about his work. I was impressed with his example of why it was meaningful to him: “It connects people in ways unimaginable a few years ago. People really depend on it to transmit critical information during times of political unrest for instance or storms”. He asked about my work too. I told him about my work advocating for babies, birth to 3. We discussed how far behind the U.S. lags in social policies, things like paid parental leave and quality affordable infant care. He seemed genuinely interested, like he “got it”, without much need for explanation. Younger people usually do get my work. That’s when we established he was, in fact, exactly half my age (23 years old)… which, other than the fact that he understood why investing in babies matters, came as a total surprise to me. Coincidentally, my aunt recently explained to me over the phone, in reference to this phenomenon I’ve noticed lately of talking to men and being suddenly surprised that I could be their grandmother, “I’m afraid it always does (come as a surprise) Jul”. We shifted our discussion to matters of parenting and family. I was thinking if I couldn’t date him, I wanted to know how someone raises a child like him? Was I doing it already with my two children OR were there secret ingredients I might learn from him that I could add to my parenting mix? He told me about his mother – how she shared my love of hot yoga and healthy eating, having no shame in calling him on a business trip to ask what he was eating and if he was taking care of himself? He said it was sweet not meddling, and he added that she has always been this way. He said, in fact, her interest in conscious living was so deep-seated, she and his father were currently in Nepal on a “healing retreat”. (Time out: Married people in their 50’s together on a healing retreat? I was already in love with them and didn’t even know their names.) He went on to tell me about his sister who just graduated from Juilliard as a ballerina. I think he told me about other siblings as there were 5 and he was the youngest, but some of this is a blur. I started to go into my own little Fantasyland at Nepal. I do remember he talked about his love of all things nerdy and how I should continue to support my son’s interest in coding in particular and my daughter’s gift for the performing arts. He said it sounded like I was doing everything right as a mom. I was getting a pep talk from a 23 year old and it felt good. By now I was ready to sit down to dinner with his family and ask them more questions… “How did you do it?” I’d begin, while sipping hot tea. I really admired what a confident and alive young man he was…well, until the turbulence started and suddenly, without any warning, he grabbed my hand with his, which was cold and clammy. With a look of shock (at himself I think or maybe in reaction to my look of shock at his grabbing my hand so unexpectedly?) but not letting go, he said “I’m scared. Can I keep holding your hand?” At this point the whole left side of his body was pressed against the right side of mine. I hadn’t noticed it before but the armrest was up. His thighs were bigger than I expected. His body was strong and warm other than his hand, like I mentioned, which was clammy and cold. It seemed a little forward and odd of him to want to keep holding my hand…but i said sure, of course. I mean what else could a good person say? That’s when I noticed he was holding his breath. I suggested he close his eyes, try to think about something relaxing and breathe with me. He did and we breathed together. I told him to concentrate on breathing out (I know from consulting my best friend who happens to be a therapist, the problem lies not in breathing in, the problem lies in not breathing out.). We breathed together…in… and out… in… and out…in…and out. Eventually, his breath calmed down and was in sync with mine. We kept breathing like that until, well, I finally had the nerve to look over at his face (before this point, I didn’t want to look directly at him and hold his hand and breathe with him. It all felt just way to intimate somehow) and that’s when I realized he had fallen asleep… holding my hand! The really awkward thing was my sister was sitting several rows up. I kept wondering what she would think if she walked by and saw me holding a random guy’s hand, someone I met just twenty minutes ago. She’s too nice to say anything—plus I’m going through a divorce and while she has historically been exceptionally generous and patient with me, she has been particularly so lately, as I’ve begun to navigate the dating world. Would she think it was all prearranged on-line? I couldn’t help but imagine her look of total disbelief. At the very least, she’d give me a “WTF?” with her eyes. His grip was strong and I worried if I pried his hand loose to avoid all that embarrassment with my sister, I’d disturb him and he did look awfully peaceful. So, I just decided to enjoy it…because really, WTF? So I closed my eyes too and pretended that I was on my way to Paris for the weekend holding hands with a new lover (instead of on my way to a memorial service in Detroit, holding hands with a stranger). When he woke up (what seemed like a really long time later), the turbulence was gone. He thanked me and smiled and we unpeeled our hands. The rest of the flight I felt a little cheated somehow…like that was it? And that’s the story of the boyfriend I had for a short while on a flight from San Francisco to Detroit. While waiting for a guy to squeeze his Suburban into a compact space, I wondered why he wasn’t just taking the space three up from him that was for bigger cars like his? 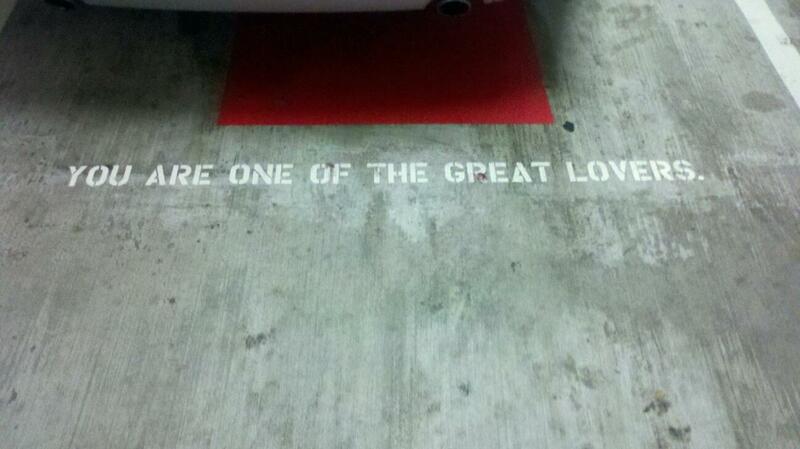 Then I noticed the white lettering on the pavement of this particular space “YOU ARE ONE OF THE GREAT LOVERS” . Sitting there trapped until he got it all sorted out, I started to notice that every single space had a different fortune. Hahaha! His efforts started to make sense. Several minutes later, after he was awkwardly wedged in (and don’t ask me how he opened the door to get out), I drove on. First I passed up one that read “YOU KNOW MORE THAN THE NEXT GUY” (I’m like duh and that’s exactly why I’m not parking THERE). Then I passed up “HAPPINESS IS TRYING TO CATCH YOU” (trying to catch me? no thanks) “GOOD THINGS ARE BEING SAID ABOUT YOU” (yeah right)… I kept passing up… and passing up… really getting into thinking about whether or not I wanted a particular message attached to me all night and thinking I know I can do better. 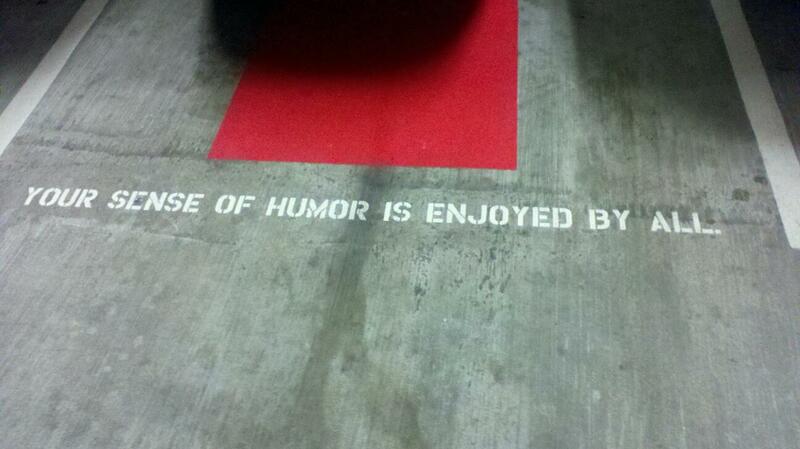 But after driving up three more floors than necessary and getting later and later for where I was going, I finally settled on my last option before having to return down again and start my search all over from the bottom “YOUR SENSE OF HUMOR IS ENJOYED BY ALL”. (Maybe it’s not be true but I thought to myself… I can live with that). And that’s what started all the laughing that night… and it just got better with my friends celebrating their 40th birthdays together with all their fun funny friends, including me. Good times. There is so much to smile about in San Francisco. For instance, the sunny micro climate of the Castro and the handsome young man walking down the street before me in cardinal red wrestling shorts.